Home » Community » VegWeb-o-Rama » Weekly Giveaway: Veganize This! by Jenn Shagrin! Allychristine is the winner! Weekly Giveaway: Veganize This! by Jenn Shagrin! Allychristine is the winner! Well, I'm not sure if Jenn Shagrin, the author of brand new vegan cookbook, Veganize This! 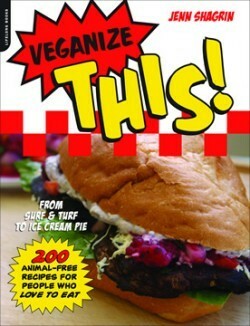 : From Surf & Turf to Ice-Cream Pie--200 Animal-Free Recipes for People Who Love to Eat (http://www.amazon.com/Veganize-This-Ice-Cream-Pie-200-Animal-Free/dp/0738214027), is Italian, but she's definitely awesome. Also, Veganize This! includes a recipe for Quattro Formaggio White Truffle Macaroni and Cheese, and that sounds pretty Italian, right? Ethnicity aside, Jenn and her cookbook are freaking amazing. She's a master of vegan meat and dairy substitutes — her versions will blow your mind. Plus, there's a recipe for Vegan Doritos. Need I say more? For a chance to win, let me know what your favorite Italian dish is. Giveaway ends on Tuesday, February 15th at midnight, PST! Winner will be chosen at random! Must live in USA to win. My favorite Italian dish is lasagna! Stuffed shells! I still can't believe how much tofu can taste like ricotta. I love lasagna, but I made some stuffed shells with soy cream cheese recently and it blew my mind! Anything with mushrooms, spinach, tomato sauce, mmmmmm. Oh, and garlic bread, of course! spaghetti...but cold, and sometimes as a sanwhich. you can't beat vegetable lasagna! I used to love Baked Cheese Ravioli when I wasn't vegan, and I would love to learn how to veganize it! This is such a great idea for a book! I hope I win, sounds awesome! Pizza. My favorite all time italian food. Allychristine is the winner! Congrats, AC! Do you have room for more cookbooks on your shelf?! ;) Congrats! Thanks! Plentyyy of room. Room for another review thread, too! vegan tofu lasagna with garlic toast is my favorite.